After arriving at Berlin Tegel airport, Michael and I stumbled across some planespotters from Germany's capital city. They showed us around so we can take some photos from our aircraft (D-ABVO). About an hour before boarding, we left them and made our way to Terminal C. Unlike the rest of the airport, this Terminal was quite modern but very small. The queue in front of the ticketing desks was huge but luckily we got our boarding passes in Frankfurt already. As we went through the security checks, an older security man wanted to do a special check with me. So I follwed him into a small room where he checked my passport and my backpack. It took about five minutes and he told me that the scanner was about 20 years old and very slow. After this procedure he thanked me and I went to Michael to check out the small duty free area. For a Duty free this small, they had a good variety of parfumes, alcohol and magazines. As we took a look onto flightradar24, we saw that our 747 in approach. So we went to a corridor, where we could see the apron and a few minutes later the massive Boeing 747-400 glid in. It was D-ABVP, a 20 years old and former "Bremen" called aircraft. After a short waiting time, the gate agent said, that the flight was ready to board. 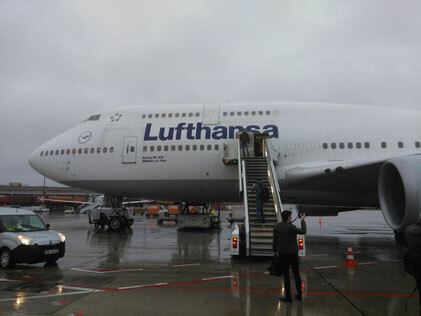 Because of a lack of time, space and cleaning personal, all 747 flights weren't cleaned or refueled in Berlin. Otherwise, Tegel couldn't take a 747 service. In very bad weather conditions we boarded "Victor-Papa" by foot. The cabin was relatively clean and unlike in Frankfurt, a flight attendant welcomed us onboard. As we waited for the pushback, the rain got worse and finally the airplane was pushed onto the taxiway and started it's engines. The enitre cabin was fully loaded with planespotters unlike the flight to Berlin where only business men were onboard. We made our way through the rain to the runway. During our stay in Berlin the wind direction had changed so we took off from 26L. Our right wing was very close to the airport fence when we taxied to the runway. I think we almost stroke a building next to the airport. With I think takeoff thrust minus 60% we took off in Berlin and made our way to Frankfurt. During climb we received some beverages and a snack. 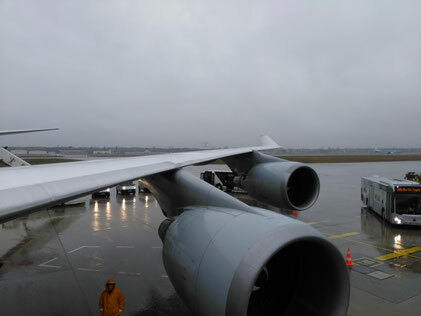 When reaching the cruising altitude, the captain already announced the beginning descent to Frankfurt and told us that the weather was as bad as in the capital city. For a few minutes we flew between two cloud bands and we could see some blue sky but as we came closer and closer to Frankfurt, the clouds got denser and denser and we had some bumps in our approach. With a right turn we lined up for our landing on runway 25L but at about 1.500 feet we got clearance for a runway change to the center runway causing a small S-turn. In final approach, my moblie went off and I had to switch to my camera for filming the landing. The weather in Frankfurt was way better than in Berlin and even better than when we left Frankfurt earlier the morning. It even stopped raining. The pilot did an amazing landing (he buttered the bread) and after breaking we left the runway to the right and taxied to a waiting position. Our provided gate wasn't clear at this time but after about 5 minutes of waiting we continued taxi with 2 engines. The pilots had shutted down two of them to save some fuel. Finally we arrived at gate A22 and after all planespotters left the airplane, Michael and I went to a flight attendent to ask if we can take a look into the flight deck. Unfortunately they denied our request but gave us the ability to take a quick look into Lufthansa's upper deck with the business class. We left the airplane and made our way home after an exciting and stressful day.